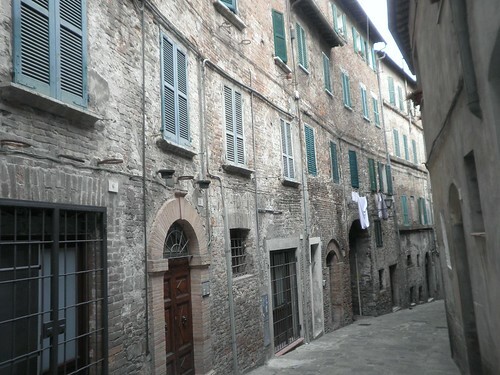 Well, I have settled in and now feel comfortable in my new city of Perugia. As I mentioned previously, my apartment is a little odd, but it gives me something to talk about and I like my roommates. Also, our building, like all the others here, is hundreds of years old and the stone construction (they don’t make them like they used to!) keeps us cool. The biggest disappointment has been my school, L’Università per Stranieri di Perugia, which I chose for its good reputation. Perhaps it was good once, but now it’s a chaotic mess—and that’s saying something in Italy. Classes started late and students queued for hours to wait for their course schedules, only to be told to return the next day to pick them up…and then told to return the next day…and then the next. Classes finally started Monday and mine is massive—36 people! Our poor teachers are overwhelmed and everyone is frustrated. Fortunately, I like my classmates. We’re of various ages and countries, though all the Americans aside from me are still in college (fellow Americans, you’re allowed to travel after study abroad, fyi). Unfortunately, the skill level of my class varies greatly, with about half of us able to hold conversations in Italian and the other half barely managing ‘ciao.’ For this reason, I sought out a private tutor, whom I met with on Friday. It went well and I plan to meet with him again before he leaves for vacation. I tried to find a language exchange (where I help an Italian with English in return for help in Italian), but that hasn’t been as easy as in New York and Rome.